So...You’re sitting at a local sushi restaurant, and as a sushi novice, you don’t know what to order. You read words like Nigiri, Sashimi, Maki, etc.. and you wander…what does it all mean? Well the folks at RA Sushi have put together a quick guide to deciphering the menu so you don’t embarrass yourself in front of your hot date. Sashimi is raw fish sliced into thin pieces. Nigiri is a specific type of sushi comprising of a slice of raw fish over pressed rice. Maki is sushi rolled up using a bamboo mat, typically with seaweed. Edamame is a fancy word for soy beans and tempura is a fancy word for fried. If you’re nervous about ordering raw fish, ask for a vegetarian roll, like RA Sushi’s Crunchy Yami Roll. If you want to really impress your date, you can drop some sushi knowledge on them by letting them know that technically the word sushi refers only to the rice and not the fish.....and lastly...Never rub your chopsticks together! The restaurant is part of a national chain that was started by Rich Howland and Scott Kilpatrick in 1997 and was eventually acquired by Benihana in 2002. 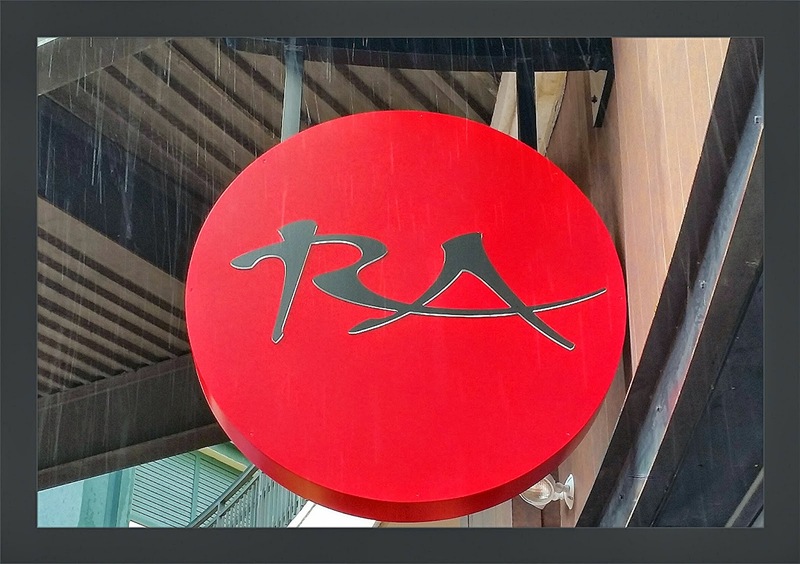 RA has locations across the country, and is based in Scottsdale, Arizona, with its original four locations scattered around the greater Phoenix area. Although Benihana owns these concepts, they are independently operated. The Concept of RA Sushi is to make sushi fun and adventurous all at once. The menu strives to take Japanese food and sushi to those who may not be brave enough to go to a traditional style sushi bar. Prices are moderate, the music is loud, and the vibe is fun. There are plenty of traditional offerings available on the Sashimi, Nigiri, and Maki Sushi menus like,Tuna, Yellowtail, Octopus, Sea Urchin and Fresh Water Eel or “Unagi”, but RA specializes in the gourmet Americanized versions with unique twists. 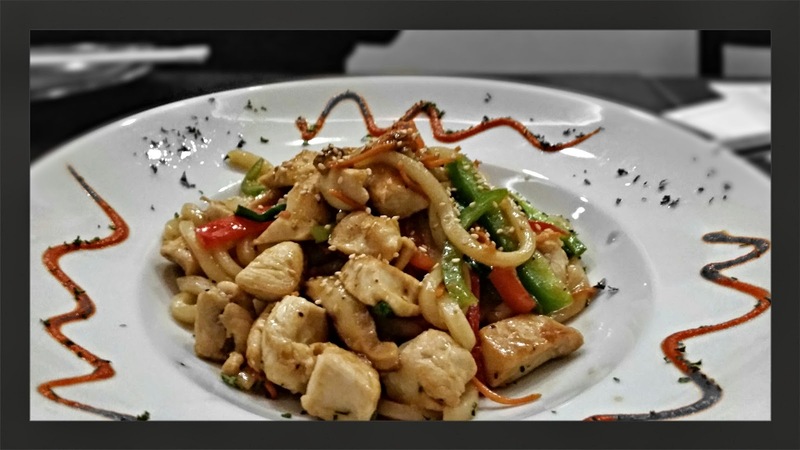 The signature dishes are things like the Viva Las Vegas roll and the Crazy Monkey roll. The Viva Las Vegas roll is a good way to define the sushi at RA, as they have sold over one million rolls. 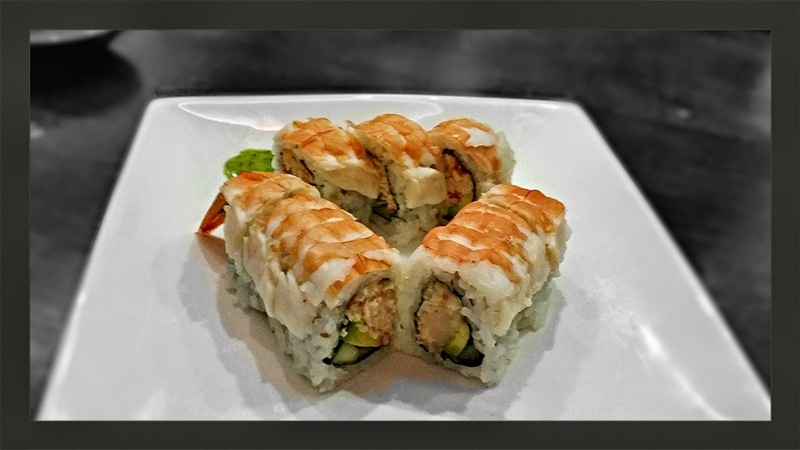 Its a very tasty combo of crab, cream cheese, rice, seaweed, light tempura batter and is topped with spicy tuna, crab mix & sliced lotus root and sweet eel sauce and tempura bits. That is certainly a mouthful of flavor, but one that sushi purists would scoff at. That is where RA is trying to unite the fun and basic with the creative and outrageous and unify the sushi lover with the sushi beginner. When you couple all the wild food offerings with a pretty cool happy hour and cocktails that are just as creative as the sushi, you start getting the picture of the vibe at RA. The happy hour is from 4:00 to 7:00 and can be enjoyed anywhere in the restaurant. The Screaming Ninja, Grape Escape and Tokyo Tower, a concoction of plum wine, peach schnapps, vodka and 7-Up are just a sampling of the drinks available along with a wide variety of Sake. 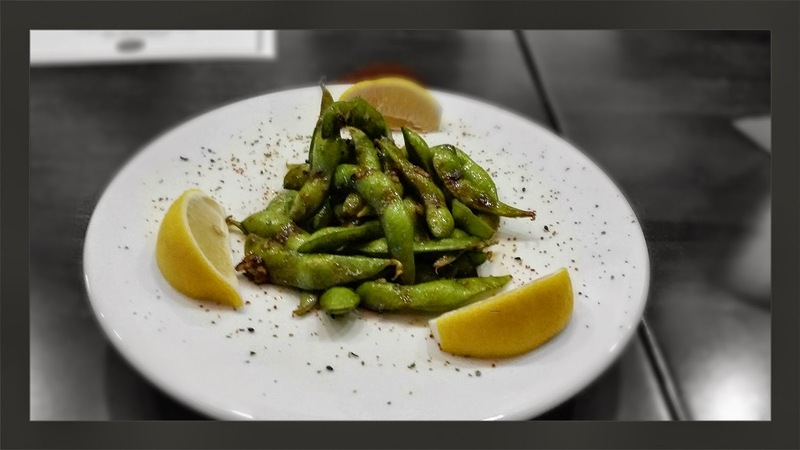 Edamame is always a good starter at a Japanese fusion place, and the Garlic Edamame with butter & Asian seasoning at RA was really good. 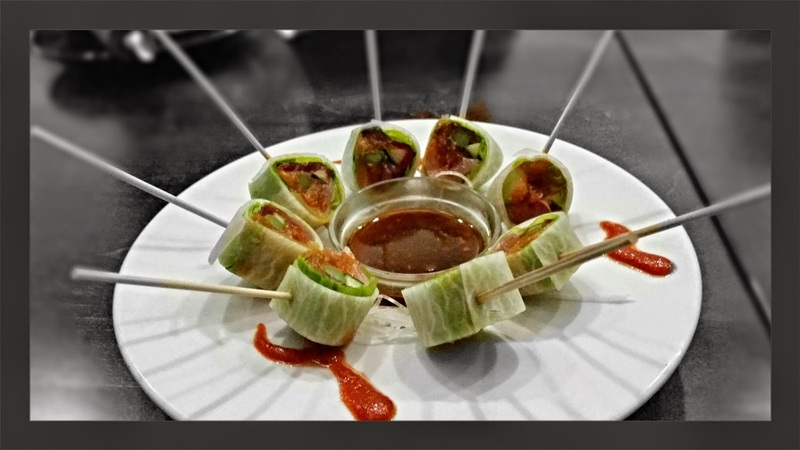 Our next starter was the RA'llipop, Its RA's take on a sushi lollipop filled with tuna, salmon, yellowtail, cucumber, lettuce and wrapped in lobok served on skewers with a garlic ponzu sauce. 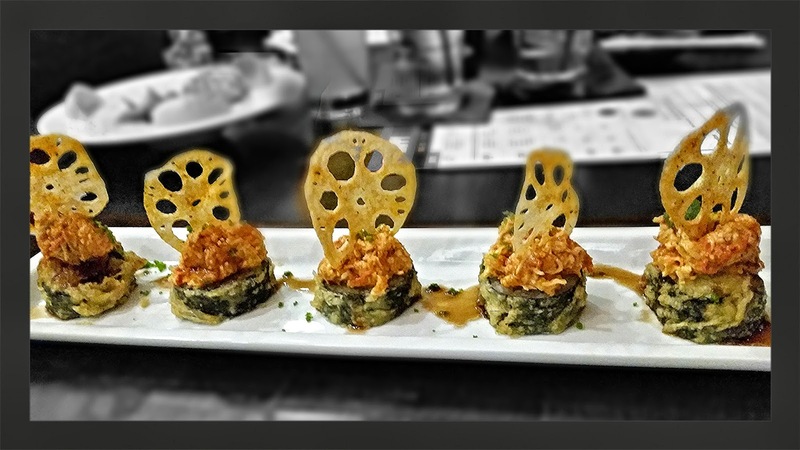 The signature Viva Las Vegas Roll with kanikama crab, cream cheese, rice, seaweed, tempura battered & topped with spicy tuna, kanikama crab mix & sliced lotus root and finished with a sweet eel sauce & spinach tempura bits...was delicious. 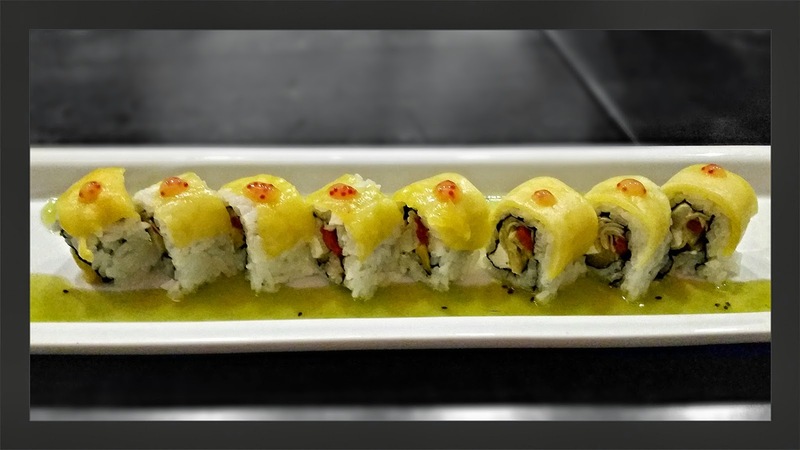 The Yellow Monkey Roll was all vegetarian with mango, roasted red pepper, artichoke, cream cheese, and topped with more mango and cashews and a kiwi wasabi drizzle. 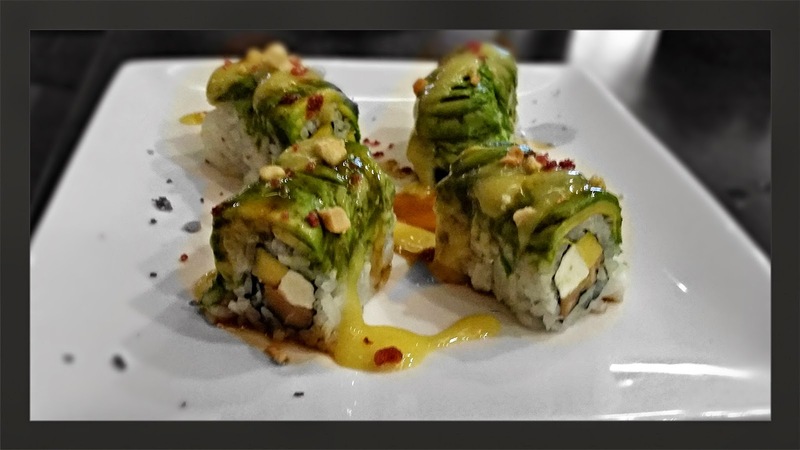 The Crazy Monkey Roll is is made with smoked salmon, mango, cream cheese, topped with avocado,beet tempura bits and and cashews, drizzled with mango and sweet eel sauce. Our final roll to sample was the Lobster Shrimp Roll with lobster, cucumber,avocado, topped with shrimp and served with Asian pesto sauce. All of the rolls we had were unique and very flavorful. After all those rolls, it was time for a SAKE break. We were treated to a flight of three 2oz. 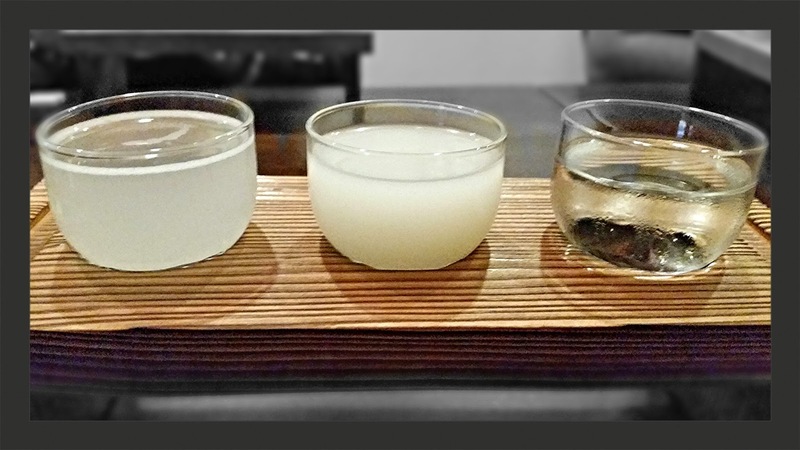 pours of Kizakura “Pure”, Sho Chiku Bai Nigori “Creme de Sake” and Kizakura “Pure” Stars with flavors that ranged from sweet, dry and sparkling. interesting. 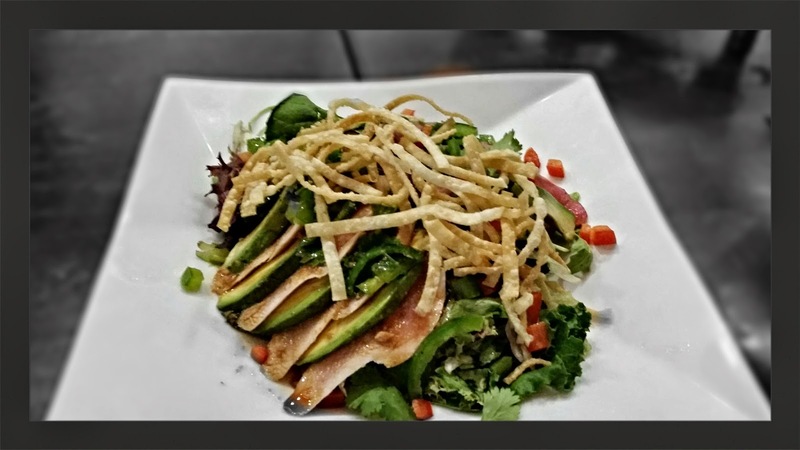 It included seared ahi tuna and albacore tuna with mixed greens, jalapeno, avocado, cilantro, cashews, wontons, and an onion soy vinaigrette. For something different without raw fish, but still Japanese, the Spicy Chicken Teriyaki Udon was a real treat, especially with the spicy teriyaki sauce. 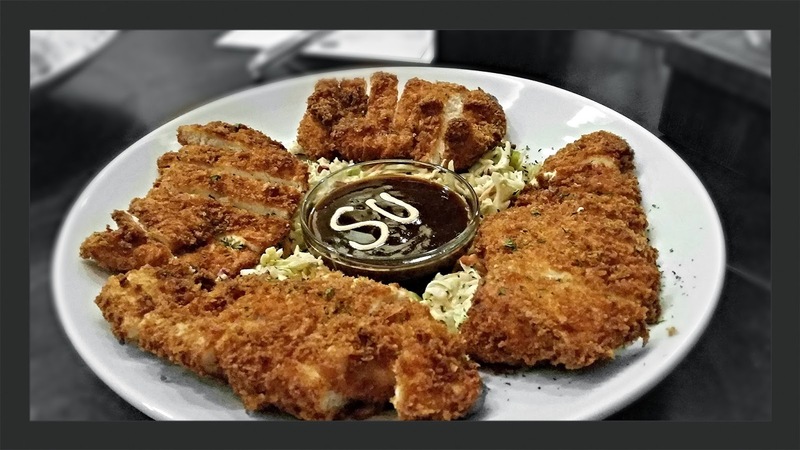 If you have people who just refuse any type of sushi, or have children dining with you at RA, the Chicken Katsu is a great choice. Wonderfully breaded in Panko crumbs and a tasty Asian BBQ sauce for dipping. 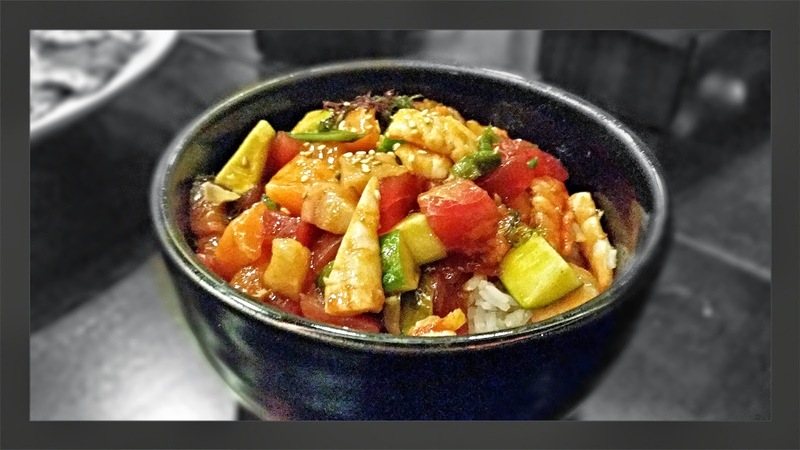 If you want all the flavors of a sushi roll, but would rather have it in fork sized pieces, the Bara Chirashi Bowl is a good idea with tuna, salmon, yellowtail, shrimp, avocado, cucumber, and green veggies served over rice with a poki sauce. What could be a better ending than a Banana Split Maki ? 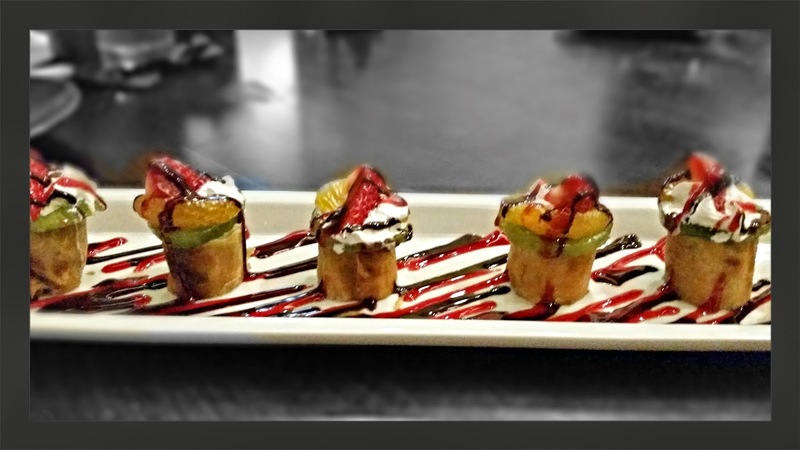 It's sushi for desert with fried banana maki topped with whipped cream and fresh fruit then drizzled with raspberry and chocolate sauces. Yes...RA Sushi is not your traditional sushi house. Its very westernized and very American, but sometimes breaking from the norm is a good thing. I really enjoyed all of the food and the ambiance they have there. 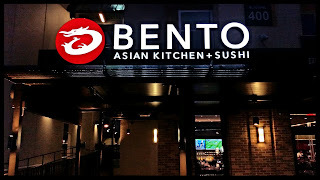 Its the kind of place where you can kick back and unwind with lively music, a cool crowd, and some pretty darn good sushi...no matter what your preferences are.